There are regulations in the Internal Revenue Code specifically designed to aid the American people in saving money. One of the most audacious efforts in that realm is Section 529. Section 529 allowed states and educational institutions to create savings plans designed for families to pre-purchase or save for future college tuition. Some programs provide tax free earnings on assets placed into the 529 plan, and that that asset growth is tax-free as long as the funds are used to pay for a child or relative’s college tuition. With the cost of attending college growing and stories abound about graduates leaving college burdened with thousands of dollars in loans used to pay for college, any program that allows parents to save toward that eventual cost would seem to be beneficial. However, 529 plans are not widely utilized. 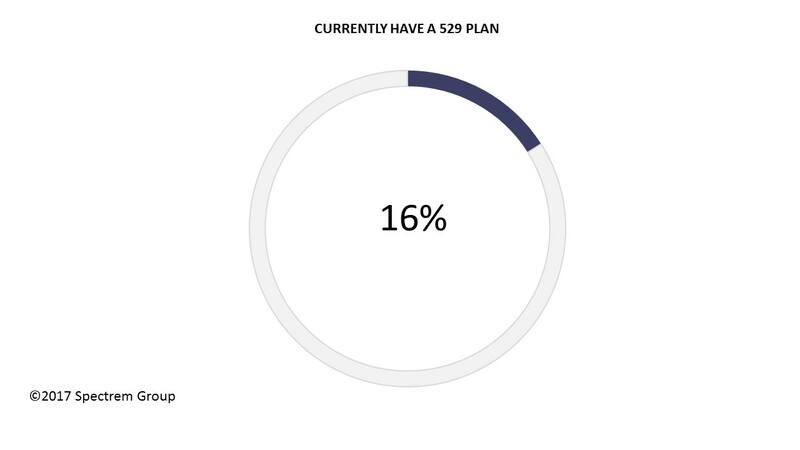 Spectrem recent research on 529 utilization with affluent investors – Wealthy Investor’s Usage of 529 Plans - found that only 16 percent currently are utilize in a 529 plan and only 20 percent have ever been used a plan of that sort. The wealthiest investors, the most aggressive investors and those under the age of 52 were most likely to have enrolled in the plan. The low percentages might seem difficult to understand, since any other savings plan that includes investments that generate income are taxed based on the income generated. Also, the funds in 529 plans are directly applied to accounts in most public and some private colleges, so that there is little functional pressure upon the investor to pay the college bills. “But some investors are insistent that they control all of their investment assets, and 529 plans take a sizable sum away from the full control of investors,’’ said Spectrem president George H. Walper Jr.
Advisors play a role in the 529 decision, and may be holding back on recommending the college tuition-designated savings plan as a solid investment choice. The reasons advisors might shy away from recommending 529 plans is simple: there is nothing in it for them. The states operate the accounts as a way to benefit residents and receive no revenue from the investments. The same is true for companies that offer tax-advantaged college savings plan. However, an investor who enrolls in a 529 plan with an investment firm is a potential future client for other investment vehicles, and should be seen as such. The Spectrem study suggests advisors think otherwise. While 75 percent of all investors know what a 529 college savings plan is, only 66 percent of advisor-dependent investors know, suggesting that some advisors are not education their clients on 529 plans. However, financial advisors are the third-most likely place for an investor to find out about 529 plans, behind website articles (29 percent of investors first found out about plans this way) and magazine articles (27 percent). Twenty-six percent of investors report finding out about 529 plans from their financial advisor. While it is true that many investors prefer to have some control over their investments, and 529 plans assign a specific task to a sizable amount of money, it is revealing that the wealthier the investor, the more likely he or she is to own a 529 plan. This means the investors who feel they can afford to put away thousands of dollars towards a fund specifically designed to pay for college often consider it a wise move. But, a huge majority of investors do not go for the 529 plans. Whether it is because college seems far away, or investors have other vehicles to fund the cost, 529 plans are not as popular as one might expect. It is true that to invest a sum that will pay for four years of college, investors must put up a good deal of money. The prepaid plans require an amount determined by the age of the child involved, and such plans run into the dozens of thousands. Savings plans build from an initial investment and hopefully includes occasional investments along the way, but it is still an expensive proposition from the start. Advisors working with investors with school-age children should give those investors the choice to consider 529 plans, accentuating the positive (tax breaks, ease of use) while presenting other ways in which an investor can save for college. Keep in mind that an investor anxious to enroll in a 529 plan is someone who looks ahead, and other products and services can be sold to such an individual. Annuities are a good “look ahead’’ product that these investors might find appealing.